Doll types, weapons, insurance, and more detailed. 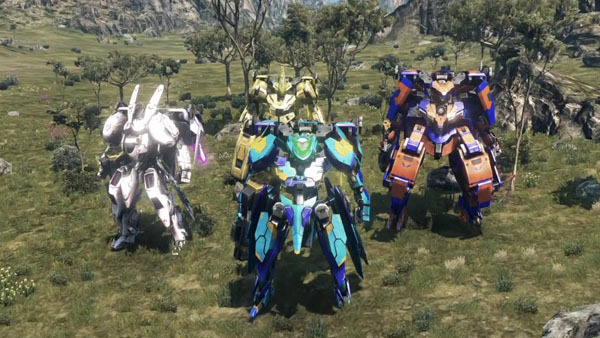 Nintendo released a new 30-minute video detailing Xenoblade Chronicles X‘s mecha “Dolls” and network features this morning. Light Type – Low HP and high evasion. Middle Type – Well-balanced andeasy to control. Heavy Type – High HP, heavy armor/defense, and requires finesse. Dolls can transform into various land vehicles depending on type of Doll, each with their own unique traits. Urban Dolls are two-wheeled, fast, and good at drifting. Inferno Dolls are four-wheeled, emphasis on stability, and have easy handling. There’s also a Caterpillar type. Dolls can also fly with a flight pack. You’ll have limited fuel, of course, and will fall back down if you run out mid-air. As for how to obtain Dolls, they are purchased from the Blade Shop. Players can own as many as they like, but each unit costs a significant amount. Dolls are capable of auto-attacking and using Arts. Their Arts change based on equipment. Equipment includes: dedicated auto-attack hand weapon, Arts-casting hand weapons, spear weapons, back weapons, and shoulder weapons. (Basically all non auto-attack weapons are Arts weapons.) Arts weapons have slots and can be separately equipped on left and right sides. Arm weapons include: the beam shield and vulcan, among others. Many have support arts that have properties like buffs and debuffs. Spare weapons are typically stored along Doll’s legs. They have short recast time and are easy to use. Back weapons are especially powerful. Right-handed ones tend to be for offense and are as such powerful, while left is more about support. Some can be used in both slots and are especially potent. Shoulder weapons even more powerful than back weapons. Like back weapons, right is about power, left is about support. Doll weapons can also bought from shops. Some high-tier types can’t be bought, but instead must be crafted from recipes. Weapons with lots of equippable slots are particularly fearsome. Doll parts can be named and their parts individually colored. Focusing purely on super powerful parts is bad for fuel, so it is not recommended. Flying and using Arts takes up fuel. Powerful arts are especially greedy, meaning players can run out of fuel if they’re not careful. If they run out of fuel, naturally, they’re unable to use Arts. Dolls will regain fuel if players eject from them, but slowly. Fuel can be instantly replenished when you’re at New Los Angeles, but takes a large amount of Miranium. Doll combat tactics emphasize exploiting enemies in a collapsed state by using the “Catch” mechanic. During Catch, enemies are unable to move, nor attack. In exchange, Dolls deal more damage and are significantly more accurate. Additionally, a well-timed B button press will continue the Catch state. Cockpit Mode sometimes engages during battles inside Dolls. In Cockpit Mode, recast times for Arts are replenished instantly, allowing for a barrage of strong attacks to hit one after the other. Whether it activates depends on luck, though. Dolls are also able to use Overclock Gear, upping their damage output, recast times, etc. Because your parts can get destroyed by the enemy, you won’t be able to use a certain weapon when, for example, an arm is destroyed. If you continue getting hit, the Doll will be completely destroyed. If that happens, you’ll be able to use your insurance for the first three times to recover the Doll for free. After the fourth time, however, you’ll need to pay a hefty fee. Of course, buying a new one costs even more money, so it’s important to keep your Doll intact and not-destroyed. There are always other players roaming about the game somewhere. When connected to the network, you can meet up with other members of Blade (players) and explore Mira. Together, you can fight, gain experience points, and secure human resources. Squads consists of 32 people, including your online allies that have been exploring Mira. Together, you can combine your power and explore. Blade Report is a feature that allows players to share info about Mira for more effective exploration. Sending reports of discoveries to the Squad will forward your findings to the other members. Valuable findings can be highly rated, with well-regarded reports potentially going on to be shared even outside the Squad. Squad Missions are subjugation and gathering missions that players can take on with their squad at fixed times. During these missions, the number of items you collect and enemies you defeat are displayed on screen, and for each you collect or defeat, your quota will decrease. If you achieve one within the five conditions of Squad Missions, you’ll receive a Squad Quest. Squad Quests are special missions that players can take on in a four-person squad. At Blade Headquarters, there is a special terminal players can use to access the network and recruit squad members for these quests. It’s possible to take along NPC members like Rin, as well. When you clear Squad Missions and Squad Quests, your reclamation of the game’s vast world will increase. Accompanying this rise in reclamation value are “World Enemies,” which appear the more you reclaim the planet. Although difficult, the reward for defeating a World Enemy is big. Some World Enemies appear at fixed intervals, as well. Blade has eight units known as “Unions” with different duties. “Union Grams” display what each Union is currently doing. Each Union has its own respective activities they are recommended to carry out. By performing said recommendations, players can achieve a higher rating for their Union. Various different entries are being prepared for online rankings. Xenoblade Chronicles X is due out on April 23 in Japan, and later this year in North America and Europe.